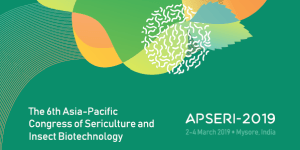 The International Sericultural Commission (ISC), Bangalore take great pleasure in announcing the 6th Asia-Pacific Congress of Sericulture and Insect Biotechnology (APSERI) scheduled to be held at Hotel Raddisson Blue, Mysore, during 2nd to 4th March 2019. The Congress is an international forum committed exclusively for the sericulture science that provides access to progress made in science and technology, current knowledge of the field and the future opportunities for silkworm and silk. The theme of APSERI-2019 is “Go for Silk Go to Nature”.